Dendrochronology (from Greek δένδρον, dendron, "tree"; χρόνος, khronos, "time"; and -λογία, -logia) or tree-ring dating is a method of scientific dating based on the analysis of tree-ring growth patterns. This technique was developed during the first half of the twentieth century, originally by astronomer A. E. Douglass, the founder of the Laboratory of Tree-Ring Research at the University of Arizona. Douglass sought to better understand cycles of sunspot activity and correctly reasoned that changes in solar activity would affect climate patterns on Earth, which would subsequently be recorded by tree-ring growth patterns. 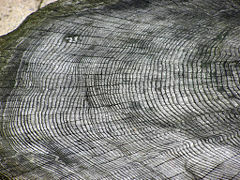 The technique of dendrochronology can date tree rings in many types of wood to the exact calendar year when each ring was formed. Growth rings, also referred to as tree rings or annual rings, can be seen in a horizontal cross section cut through the trunk of a tree. Growth rings are the result of new growth in the vascular cambium, a lateral meristem, and are synonymous with secondary growth. Visible rings result from the change in growth speed through the seasons of the year, thus, one ring usually marks the passage of one year in the life of the tree. The rings are more visible in temperate zones, where the seasons differ more markedly. The inner portion of a growth ring is formed early in the growing season, when growth is comparatively rapid (hence the wood is less dense) and is known as "early wood" or "spring wood" or "late-spring wood." The outer portion is the "late wood" (and has sometimes been termed "summer wood," often being produced in the summer, though sometimes in the autumn) and is denser. "Early wood" is used in preference to "spring wood," as the latter term may not correspond to that time of year in climates where early wood is formed in the early summer (for example, Canada) or in autumn, as in some Mediterranean species. Many trees in temperate zones make one growth ring each year, with the newest adjacent to the bark. For the entire period of a tree's life, a year-by-year record or ring pattern is formed that reflects the climatic conditions in which the tree grew. Adequate moisture and a long growing season result in a wide ring. A drought year may result in a very narrow one. Alternating poor and favorable conditions, such as mid summer droughts, can result in several rings forming in a given year. Trees from the same region will tend to develop the same patterns of ring widths for a given period. These patterns can be compared and matched ring for ring with trees growing in the same geographical zone and under similar climatic conditions. Following these tree-ring patterns from living trees back through time, chronologies can be built up, both for entire regions, and for sub-regions of the world. Thus wood from ancient structures can be matched to known chronologies (a technique called cross-dating) and the age of the wood determined precisely. Cross-dating was originally done by visual inspection, until computers were harnessed to do the statistical matching. To eliminate individual variations in tree ring growth, dendrochronologists take the smoothed average of the tree ring widths of multiple tree samples to build up a ring history. This process is termed replication. A tree ring history whose beginning and end dates are not known is called a floating chronology. It can be anchored by cross-matching either the beginning or the end section against the end sections of another chronology (tree ring history) whose dates are known. Fully anchored chronologies that extend back more than 10,000 years exist for river oak trees from South Germany (from the Main and Rhine rivers). Another fully anchored chronology that extends back 8,500 years exists for the bristlecone pine in the Southwest U.S. (White Mountains of California). Furthermore, the mutual consistency of these two independent dendrochronological sequences has been confirmed by comparing their radiocarbon and dendrochronological ages. In 2004, a new calibration curve, INTCAL04, was internationally ratified for dates calibrated back to 26,000 Before Present (BP) based on an agreed worldwide data set of trees and marine sediments. Pine stump showing growth rings. Timber core samples measure the width of annual growth rings. By taking samples from different sites and different strata within a particular region, researchers can build a comprehensive historical sequence that becomes a part of the scientific record; for example, ancient timbers found in buildings can be dated to give an indication of when the source tree was alive and growing, setting an upper limit on the age of the wood. Some genera of trees are more suitable than others for this type of analysis. Likewise, in areas where trees grew in marginal conditions such as aridity or semi-aridity, the techniques of dendrochronology are more consistent than in humid areas. These tools have been important in archaeological dating of timbers of the cliff dwellings of Native Americans in the arid Southwest. 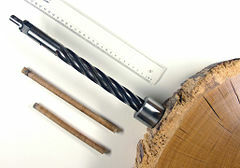 A benefit of dendrochronology is that it makes available specimens of once-living material accurately dated to a specific year to be used as a calibration and check of radiocarbon dating, through the estimation of a date range formed through the interception of radiocarbon (BP) and calendar years. The bristlecone pine, being exceptionally long-lived and slow growing, has been used for this purpose, with still-living and dead specimens providing tree ring patterns going back thousands of years. Similar seasonal patterns also occur in ice cores and in varves (layers of sediment deposition in a lake, river, or sea bed). The deposition pattern in the core will vary for a frozen-over lake versus an ice-free lake,and with the fineness of the sediment. These are used for dating in a manner similar to dendrochronology, and such techniques are used in combination with dendrochronology, to plug gaps and to extend the range of the seasonal data available to archaeologists. While archaeologists can use the technique to date the piece of wood and when it was felled, it may be difficult to definitively determine the age of a building or structure that the wood is in. The wood could have been reused from an older structure, may have been felled and left for many years before use, or could have been used to replace a damaged piece of wood. European chronologies derived from wooden structures found it difficult to bridge the gap in the fourteenth century, when there was a building hiatus that coincided with the Black Death. Other plagues that were less well recorded also appear in the record. In areas where the climate is reasonably predictable, trees develop annual rings of different properties, depending on weather, rain, temperature, and so forth in different years. These variations may be used to infer past climate variations. Given a sample of wood, the variation of the tree ring growths provides not only a match by year, it can also match location because the climate across Europe is not consistent. This makes it possible to determine the source of ships as well as smaller artifacts made from wood but which were transported long distances. ↑ M. Friedrich, et al., The 12,460-year Hohenheim oak and pine tree-ring chronology from central Europe—A unique annual record for radiocarbon calibration and paleoenvironment reconstructions. Radiocarbon 46: 1111–1122. ↑ J.R. Pilcher, et al., A 7,272-year tree-ring chronology for western Europe, Nature 312: 150–152. ↑ C.W. Ferguson and D.A. Graybill, Dendrochronology of Bristlecone Pine: A Progress Report, Radiocarbon 25 (1983): 287–288. ↑ Minze Stuiver, et al., Radiocarbon Age Calibration back to 13,300 Years BP and the 14C Age Matching of the German Oak and US Bristlecone Pine Chronologies, Radiocarbon 28(2): 969–979. ISSN 0033-8222. ↑ Paula J. Reimer, et al., INTCAL04 Terestrial Radiocarbon age calibration, 0–26 cal kyr BP, Radiocarbon. 46(3): 1029–1058. Retrieved October 18, 2008. ↑ Colin Renfrew and Paul G. Bahn, Archaeology: Theories, Methods and Practice, 4th ed. (London: Thames & Hudson, 2004, ISBN 0500284415). ↑ M.G.L. Baillie, A Slice Through Time: Dendrochronology and Precision Dating (London: Batsford, 1995, ISBN 0713476540). Baillie, M.G.L. 1995. A Slice Through Time: Dendrochronology and Precision Dating. London: Batsford. ISBN 0713476540. Cook, E.R., and L.A. Kairiukstis. 1990. Methods of Dendrochronology: Applications in the Environmental Sciences. Dordrecht, The Netherlands: Kluwer. ISBN 0792305868. Fritts, Harold C. 2001. Tree Rings and Climate. Caldwell, NJ: Blackburn Press. ISBN 1930665393. Stokes, Marvin A., and Terah L. Smiley. 1996. An Introduction to Tree-Ring Dating. Tucson, AZ: University of Arizona Press. ISBN 0816516804. The Laboratory of Tree-Ring Research. The University of Arizona. Welcome to the Laboratory of Tree-Ring Science. The University of Tennessee, Knoxville. University of Victoria Tree-Ring Laboratory. Mistik Askiwin Dendrochronology. University of Saskatchewan. This page was last modified on 26 October 2017, at 18:30.